I am Peace offering and harmony to remove conflict. Known as Pte Ska Win, White Buffalo Calf Woman appeared during a famine and told the Lakota people that she was wakan (holy). She taught the lakotas seven sacred ceremonies and gave them the sacred ceremonial pipe. Spending four days with the people, White Buffalo Calf Woman taught them sacred songs, dances, and ceremonies as well as the traditional ways. She then left in the same manner she had arrived, telling the people she was leaving the sacred bundle, the White Buffalo Calf Woman pipe, in their care. She promised to one day return for it and to bring harmony and spiritual balance to the world. White Buffalo Calf Woman brings forth an offering of peace, from the peace pipe, into our lives. To help us heal the restlessness that is deep within us. She helps us to connect with Mother Earth and Father Sky to allow us to come into our balance with our personal harmony. She showers us with her magnificent light of Mother, Father, God of Gold & Silver threads of light entering our consciousness and into our hearts. She is bringing forth practices of harmlessness towards all animals and to connect to the consciousness telepathically to them all. She also brings the white sage to help us clear away negative dross that no longer serves us. In this painting of White Buffalo Calf Woman, she connects through ancient geometry symbols, linking the pyramid above and below. 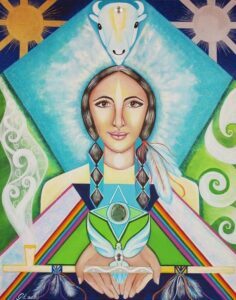 Above her in the painting is the higher consciousness of the white buffalo calf, bringing forth the serenity of the light from the soul star and installing this into the consciousness through to her 3rd eye, throat and heart. She has the turquoise crystal in her heart, uniting father sky and mother earth. Her hands extend the offering of the peace pipe and healing.